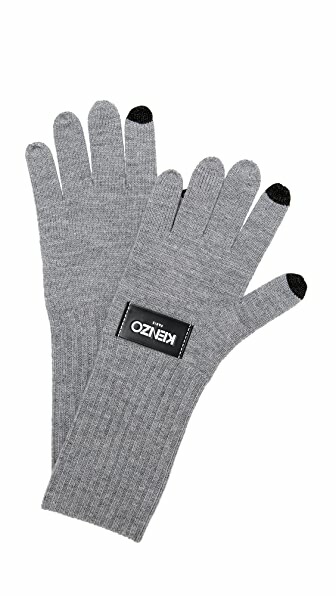 Knit KENZO gloves, crafted with touchscreen-friendly pads at the forefinger and thumb. Ribbed cuffs. Fabric: 100% wool. Wash cold. Imported, China. 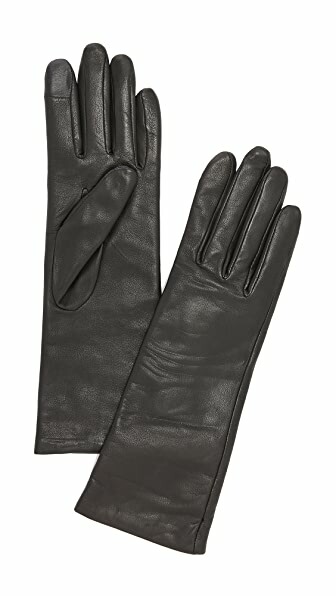 These timeless Carolina Amato gloves are rendered in supple lambskin. Silk jersey lining. Shell: 100% lambskin. Lining: 100% silk. Leather clean. Made in Italy. Perforated holes and snap-buckle closures complement the biker-luxe edge of these fingerless Carolina Amato leather gloves. Lined. 100% lambskin. Leather clean. Imported, China. 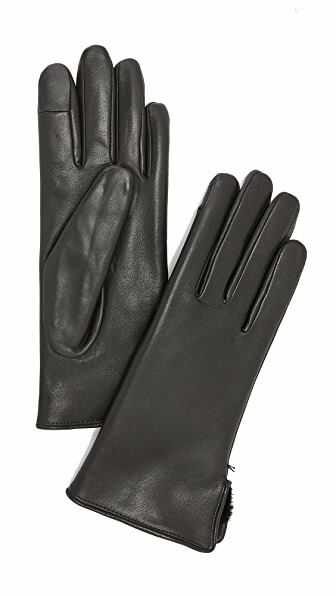 Classic Carolina Amato leather gloves styled in a slim silhouette. Snap closure. Lined. 100% lambskin. Leather clean. Imported, China. 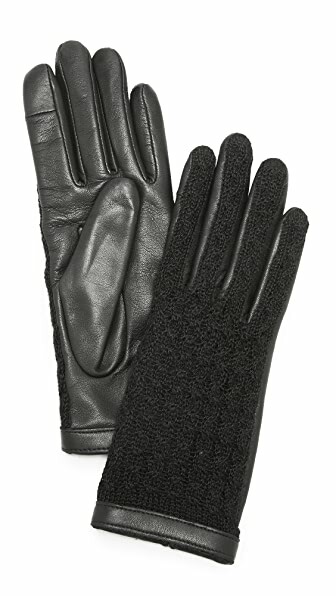 These classic Carolina Amato leather gloves are accented with an optional knit overlay. Shell: 100% lambskin. Lining: 100% rayon. Leather clean. Imported, China. 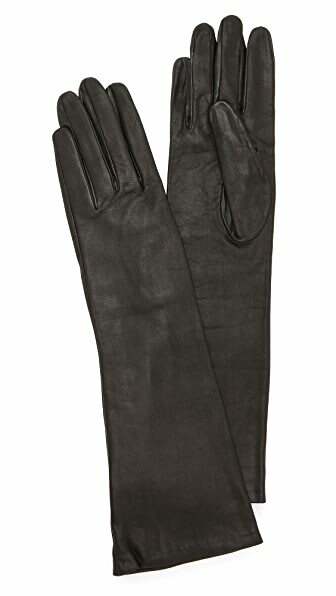 Rich leather trims these fingerless Carolina Amato gloves, adding a chic edge to the comfy silhouette. Shell: 50% cashmere/50% wool. Trim: 100% lambskin. Leather clean. Imported, China. 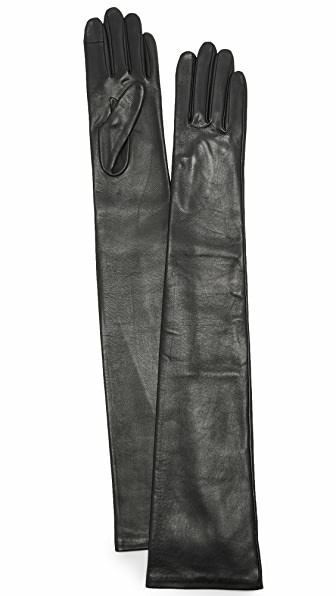 Chic leather Carolina Amato gloves, styled with bows at the snap-tab cuffs. Lined. Leather: Goatskin. Leather clean. Imported, China. 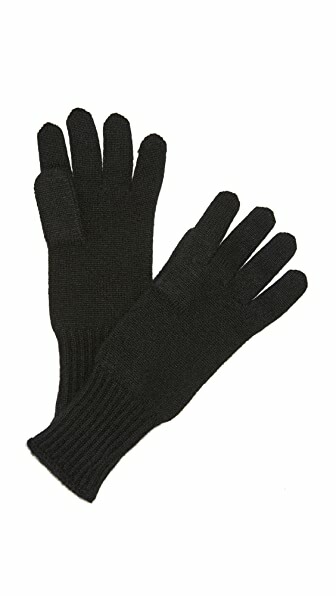 These plush knit Carolina Amato gloves have topstitched tips, allowing for easy touchscreen use. Picot-edged cuffs. 70% wool/30% cashmere. Dry clean. Imported, China. 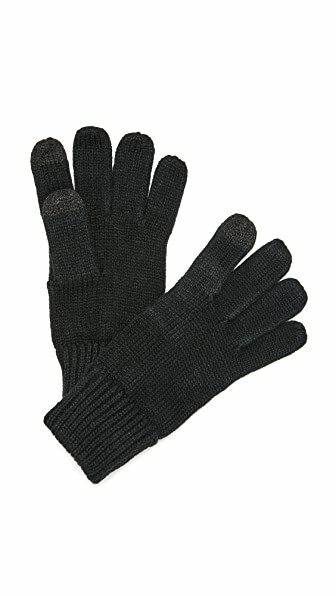 Textured patches at the thumb and index finger make these knit Hat Attack gloves ideal for texting. Ribbed cuffs. 100% acrylic. Dry clean. Imported, China. 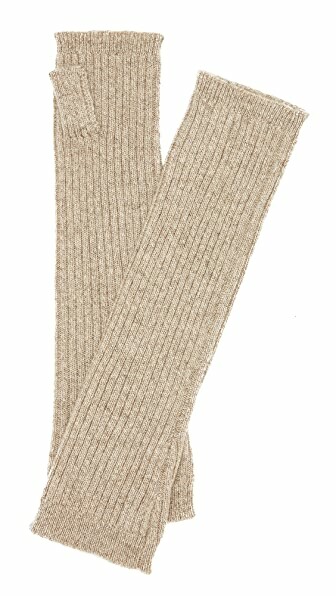 Luxurious Hat Attack arm warmers, composed of ribbed knit cashmere. 100% cashmere. Dry clean. Imported, Mongolia. 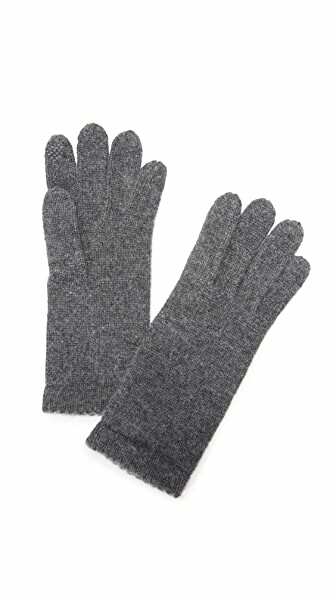 Lightweight knit Hat Attack gloves composed of luxe cashmere. Ribbed cuffs. 100% cashmere. Dry clean. Imported, Mongolia. 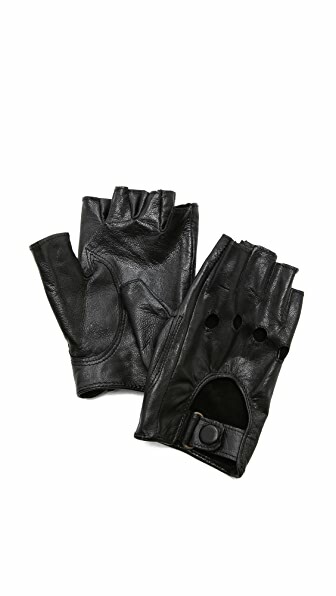 Touchscreen-compatible Agnelle gloves made from super-soft leather. 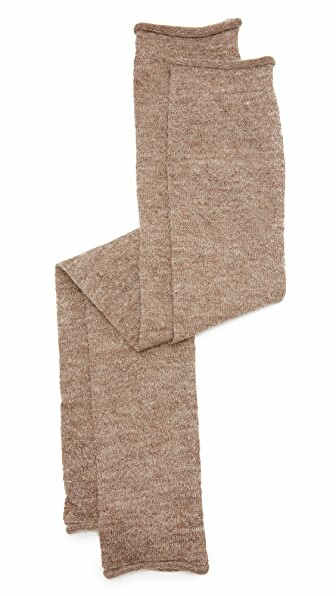 Soft alpaca-knit lining. Leather: Lambskin. Regular Leather clean Imported, Philippines. 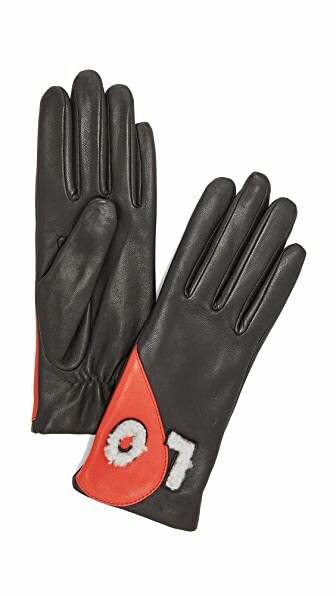 Stretch lambskin Agnelle opera gloves with touchscreen-conducive index finger and thumb tips. Leather: Lambskin. Leather clean. Imported, Philippines. 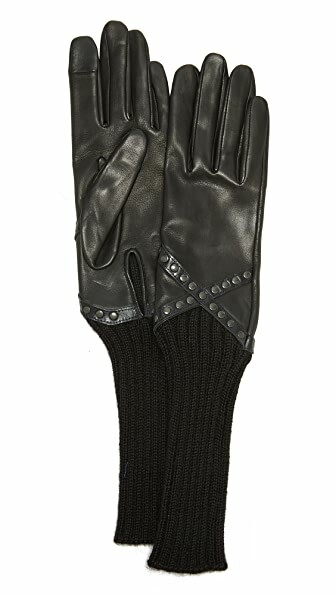 Studded trim details the cuffs of these lambskin Agnelle gloves. Touchscreen-conducive index finger and thumb tips. Leather: Lambskin. Leather clean. Imported, Philippines. Chenille 'Love' lettering and halves of a heart detail these lambskin Agnelle gloves. Touchscreen-conducive index finger and thumb tips. Alpaca-knit lining. Leather: Lambskin. Lining: 100% alpaca. Leather clean. Imported, Philippines. 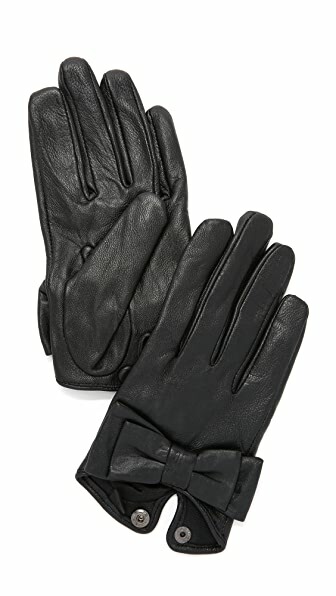 Nubuck and smooth leather comes together on these soft Agnelle gloves. Studded seams. Touchscreen-conducive index finger and thumb tips. Leather: Lambskin / goatskin. Lining: 100% silk. Leather clean. Imported, Philippines. 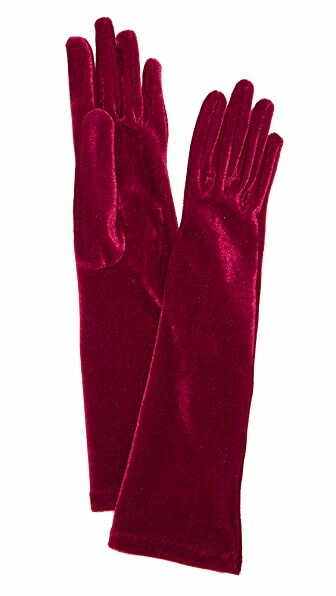 Elegant Agnelle gloves rendered in soft stretch velour. Fabric: Velour. 90% polyester/10% elastane. Hand wash. Imported, Philippines. 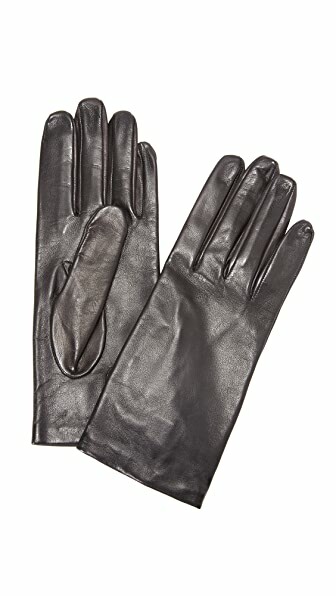 Fingerless Agnelle driver gloves in soft lambskin leather. 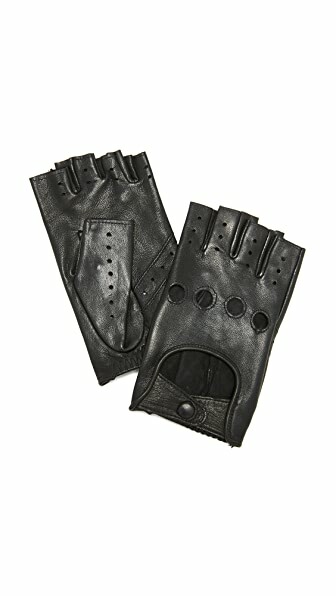 Cutout knuckles and snaps at the elastic cuffs. Leather: Lambskin. Leather clean. Imported, Philippines. 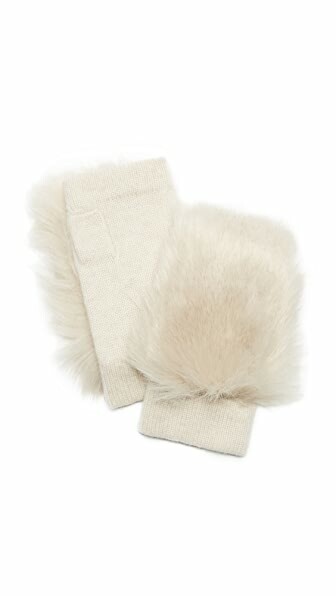 Plush rabbit-fur lining insulates these lambskin Agnelle gloves. Touchscreen-conducive index finger and thumb tips. Fur: Dyed rabbit, from Spain. Leather: Lambskin. Leather clean. Imported, Philippines. THIS ITEM CANNOT BE SHIPPED OUTSIDE THE USA. 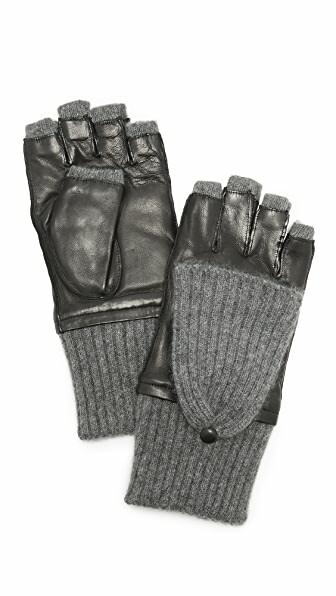 Textured alpaca knit and soft lambskin leather compose these Agnelle gloves. Touchscreen-conducive index finger and thumb tips. Snap-tab cuffs. Shell: 100% alpaca. Trim: 100% lambskin. Leather clean. Imported, Philippines. 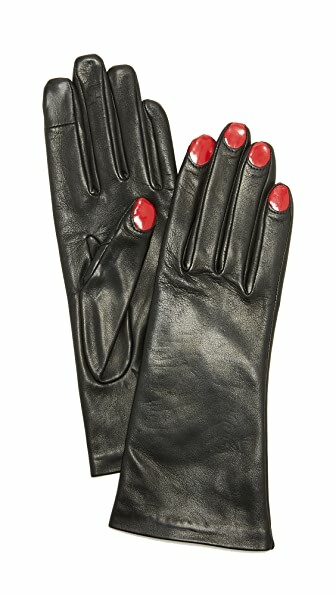 Playful Agnelle gloves in soft lambskin leather with contrast painted fingernails. Touchscreen-conducive index finger and thumb tips. Leather: Lambskin. Lining: 100% silk. Leather clean. Imported, Philippines. 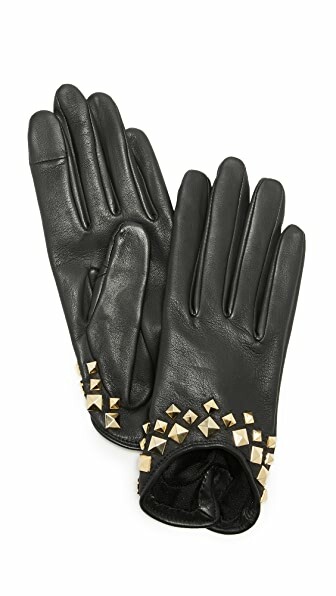 Covered studs detail these fingerless Agnelle leather gloves. Zip gussets. Leather: Lambskin. Leather clean. Imported, Philippines. 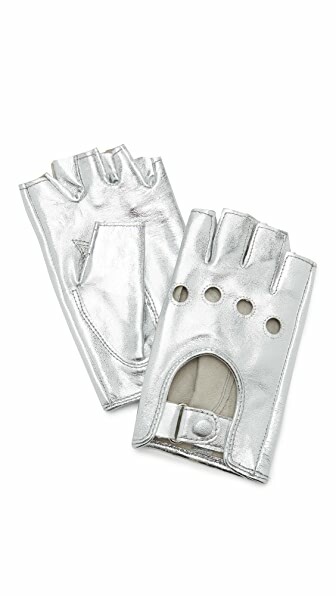 Knuckle cutouts complement the classic moto look of these metallic leather Carolina Amato fingerless gloves. Single-snap cuff. Unlined. Leather: 100% goatskin. Leather clean. Imported, China. 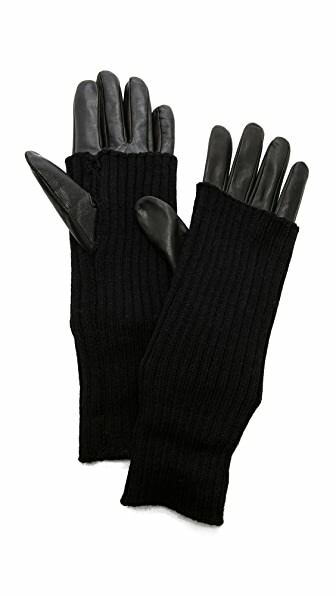 Sleek leather adds an elegant finish to these ribbed knit Carolina Amato gloves. 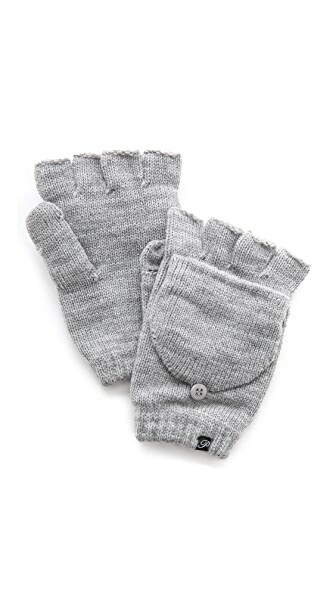 Buttoned mitten panels offer extra coverage. Leather: Lambskin. 85% cashmere/15% wool. Spot clean. Imported, China. 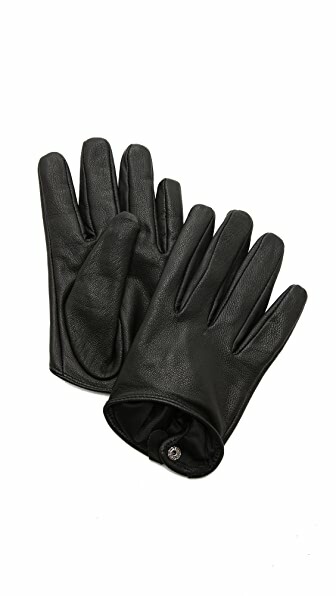 Touchscreen-compatible Agnelle gloves made from super-soft leather. Faceted studs accent the snap cuffs. Silk lining. Leather: Lambskin. Regular Lining: 100% silk. Leather clean Imported, Philippines. 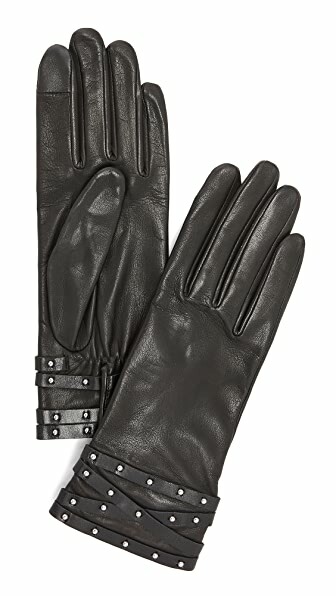 Long, ribbed-knit cuffs accent these soft lambskin Agnelle gloves with crisscross studded trim. Touchscreen-conducive index finger and thumb tips. Silk lining. Leather: Lambskin. Leather clean. Imported, Philippines. 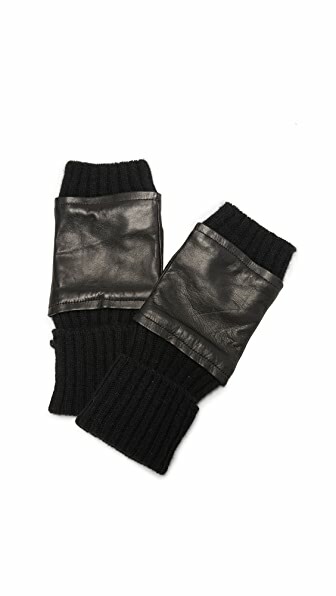 These Carolina Amato fingerless gloves are detailed with panels of glossy faux fur. Snug cuffs. 90% wool/10% cashmere. Dry clean. Imported, China.